The title of the thesis is Gentrification in Malmö, Sweden. The identified research problem is the lack of affordable housing in a city that is growing and experiencing significant physical, social, and economic changes. Changes that are partly influenced by urban redevelopment projects, enabling gentrification and affecting equity in the city of Malmö. 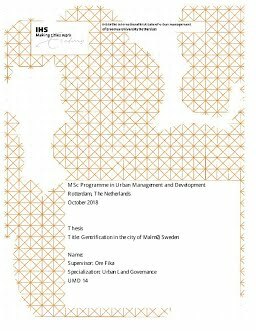 The objectives were to (1) explain the extent to which urban spatial redevelopment leads to gentrification in Malmö, Sweden; and (2) explain the impact of gentrification on social and economic equity in Malmö, Sweden. The research was designed as a case study, employing three data collection methods, interviews, observation, and content analysis. The research found that there are multiple physical changes in Malmö, there are still socio-economic challenges, in particular, to improve the employment rate and decrease the number of people with a low disposable income. In addition, it is recognized that there is gentrification and in places where it is less clear, there are still gentrification tendencies. Regarding equity, there are significant differences for the population in the quality of their welfare. One point made was the importance of equitable public spending. One conclusion is that the impact of redevelopment has made the differences within the city of Malmö more tangible. Another conclusion is that there is a high interdependency between the public and private sector, which is shaping the city’s development, and a third conclusion is that redevelopment to some extent impact gentrification, as these areas have a meaning for the city’s development overall and has changed the narrative of the city to some extent. One proposed recommendation is to test policies in order to implement more equitable distribution policy.